Andrew Aliberti opened Summer Shades in 1985, and moved to the current location at 36 Main Street in Edgartown two years later. With the help of his wife, Sarah, and their general manager Sarah McDonnell, the shop has been selling high-end sunglasses to Vineyarders for 30 years. So what brought you to the Island? AA: Well, I came here and opened this when I was in college. In my second year in college, I came here just to get a challenge in life, so I borrowed some money and opened the store. That’s what brought me here — this store, or the idea of this store. AA: I had come here a couple times with some friends, and I liked it. It was between here and Maine, and the guy that loaned me the money said he would only do it if I opened here. AA: I was in college for English, you know English major. It was Suffolk, right in the city, so I worked a couple jobs while I was doing that. One was taking passport photos. The man who hired me there was the one who loaned me the money to open this. My other job was selling cheap sunglasses off a pushcart. I enjoyed it, I liked the clientele — young, fun — it seemed to be something I could see myself doing and enjoying. It’s a great product. It’s better than handbags, probably. How did you two end up getting involved? SA: I came here for the summer. I had retail and restaurant background, that was 1991, and I had a restaurant job, and I wasn’t happy. So I asked for a job here, and I had fun. I worked for him and his buddy; it was just the two of them, basically. We just did really well in the store together. AA: Good chemistry. She was a keeper. SA: So I worked that first summer, and we had a great summer, right? AA: And we started dating, and got married, but whatever. SA: So we had a great summer but I moved back to New York, then I came back and continued to work for him. We were practically engaged the next year, so I continued to work for him ever since. SM: I came to the Island because of this job. I had worked in a different part of Andrew’s business. He had outlet stores. I was hired to run his outlet store. AA: It was a premium outlet, and Sarah was hired to manage that. And then she was hired as general manager here, like three months later. SM: So that’s what made me move here. When Sarah became pregnant with their oldest child, I started running the store here in Edgartown. So what’s it like running a business all together? AA: It’s great; we’re like a family. AA: Yeah, but I think all of us are. I’m upstairs most of the time now, but I listen to what’s going on. I think Sarah M. represents the best of what we could hope for — she’s great with customers. And with Sarah M., it’s Sarah and Sarah, so people get really confused. SA: People often think that I was the one that helped them when I know I wasn’t. SM: People are like “Either Sarah!” They know they are going to get great service. SA: And look their best. What has changed about this store over the years? AA: Probably what has changed the most is that in 1985 sunglasses shops were really new. I think the first one was 10 years old, and there weren’t many in New England. But now they’re everywhere. I think the industry has become much more mainstream. As far as our store, in the beginning I didn’t really carry fashion sunglasses. I carried sport; all I knew was sports. I think we’ve expanded on fashion, but Sarah and Sarah keep my hands off the fashion lines. AA: Other than that I think the general idea of sunglasses is that they’re an essential thing to spend money on. The first few years I did this with a buddy of mine, people would stop and say, “A sunglasses shop? They won’t be back.” They probably had a good point. But now there’s so many more brands. Back in the ’80s we had like three showcases of glasses, and one of them was Vuarnet. SA: It was huge in the ’80s. AA: They were really dark yellow lenses. SM: Somebody had them on yesterday! AA: Oh my God. Now they’re cool. What do you do to compete now that the market is more saturated? AA: Selection and service is huge. Go to most sunglasses shops. The selection isn’t great, and definitely the service isn’t what it could be. We also have a lot of customers for whom a part of their summer will be to come in here. We’re fortunate to be on the Vineyard. SM: They tell me they’re not going to shop anywhere else. And they ask us for what we think would look good on them and what we like. AA: I think when you go to a place that you love, even if it’s just for one or two weeks, it’s nice to bring something back. Why buy a pair of sunglasses up the road at the mall, when every time you put them on you can say, “Oh, I got these in Edgartown!” Don’t you think? What do people not know about sunglasses? AA: I’ve heard people come in and say, “I’ve got these polarized glasses,” and they’re not polarized. There’s so many different lenses, and there’s frame materials, and different lenses are better for different activities. So if someone bought a pair somewhere else, like at a clothing store because it was convenient, then they find out there’s a better selection, and we know what we’re talking about, and we can help them find what they’re looking for. I think that’s the beauty of the specialized shop: If it’s all you’re selling, you tend to know a lot more. And Sarah has the task of training six different people every year as quickly as humanly possible. SM: Yeah, it’s a short window. AA: I think when you come in here, you’re definitely going to get the right information. You’re not going to be sold something because it’s the most expensive, you’re going to be sold something that’s right for what you’re looking for. We try to set up a situation that’s goal-oriented, and listen to what the customer is saying. 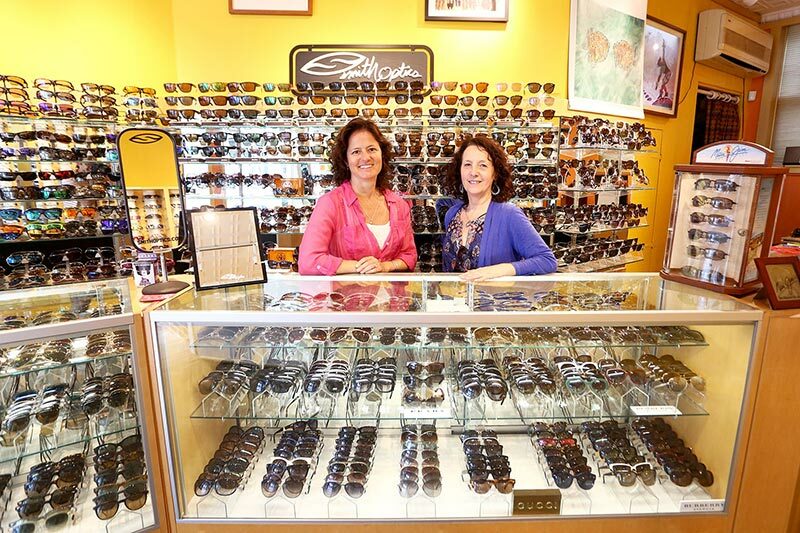 We don’t say, “Take this Maui Jim” if they don’t need a Maui Jim. Do you have any good stories? A favorite moment? SA: I’ll never forget when some little kid said, “There’s the sunglass lady!” It was the first time I’ve ever been called the sunglass lady.